The C2C Winter Shawl was designed to be a practice pattern for my Corner to Corner Crochet A Long. Corner to Corner Crochet is a beautiful stitch that creates an amazing texture. This is a great pattern to help practice the Corner to Corner increase. You will not need to know how to decrease for the pattern. If you are completely new to this stitch Check out my Corner to Corner Crochet Tutorial. I have written this pattern so that you can make this shawl with a Chunky yarn as shown in the example or a medium weight yarn. I will provide an complete row count for each. Check out the other Practice C2C patterns below or my Free Pattern Page. R1: Dc into the 4th, 5th and 6th Ch from the hook. R2-36: Ch 6, Dc into the 4th, 5th, and 6th chain from the hook. (Slst to the turning chain of the previous row, Ch 3, Work 3 Dc around the turning chain you Slst to.) Repeat from (to) to the end of the row. R2-68: Ch 6, Dc into the 4th, 5th, and 6th chain from the hook. (Slst to the turning chain of the previous row, Ch 3, Work 3 Dc around the turning chain you Slst to.) Repeat from (to) to the end of the row. If you are not familiar with the Corner to Corner Stitch, I recommend you check out my Corner to Corner Crochet Tutorial or the video tutorial below. For both sizes of yarn, from where you left off, Chain 3. [Hdc, Dc] into the Dc of the last row. Slip Stitch to the Turning Chain. *[Dc, Hdc, Dc] into the Slip Stitch of the previous row, Slst to the turning Chain. * Repeat from *to* until end of row. 2 DC into the Bottom of the Double Crochet of the previous row. Your C2C Winter Shawl is complete. You can now make tassels and add the to two or three of the corners. This is a great piece to keep you warm all winter. Are you going to make a C2C Winter Shawl for someone you love? 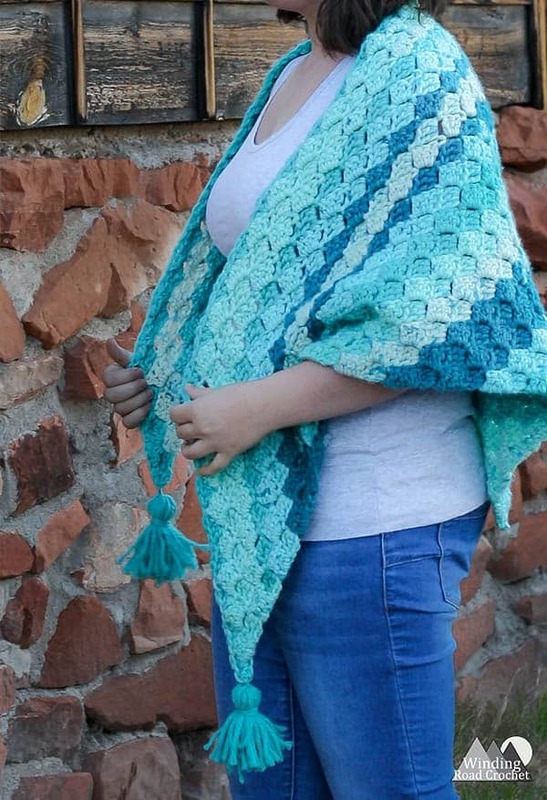 I would really like to see your finished crochet shawl, take a picture and share it with me on any social media! Just tag me @windingroadcrochet, #windingroadcrochet, or #ourcrochetjourney. Join my Facebook Group and share your creation with the community at Our Crochet Journey Facebook Group! Written pattern, tutorials, graphs and pdfs of the C2C Winter Shawl are copyright Windingroadcrochet.com. Please do not reprint or repost this content as your own, but please feel free to share this link with others. You can find more information on sharing my work with others in the Terms and Conditions Page. I am so happy you like how I do my tutorials. I’ve been crocheting for about 43 years. One of my favorite things about crochet is that there’s always some new, gorgeous stitch coming along to learn. I have been scared of C2C! I don’t know why. Your explanations of C2C really make it look easy so far. I have a cousin who can’t read patterns. The way you are including the stitch diagrams is perfect for her! Please don’t stop including them. I’m enjoying them too. I am so glad you are enjoying it all. I like using the diagrams as a visual aid. So far many people who do not know how to read diagrams have still found it understandable. I will definitely use them when I think they help. Hi Lindsey, I just watched your tutorial and it is great! So easy to follow along with you…. I’m going to make a small doll shawl to start practicing….or maybe a few for my granddaughters’ dolls. Thank you for sharing your easy to follow lessons online!